Figure 17.38 The relationship of loudness in phons to intensity level (in decibels) and intensity (in watts per meter squared) for persons with normal hearing. The curved lines are equal-loudness curves—all sounds on a given curve are perceived as equally loud. Phons and decibels are defined to be the same at 1000 Hz. See Figure 17.38. The ear is not especially sensitive to this frequency. Resonance in the ear canal is either not significant, or it's more complicated than accounted for by this model of the ear canal as a simple tube closed at one end. This is College Physics Answers with Shaun Dychko. We are going to model the ear canal as a tube that is closed at one end. This end being the ear drum, I suppose. And we are going find the frequency of its first overtone. Now, the fundamental wavelength divided by four will fit within the ear canal. So in deriving a sort of expression for the first overtone here. 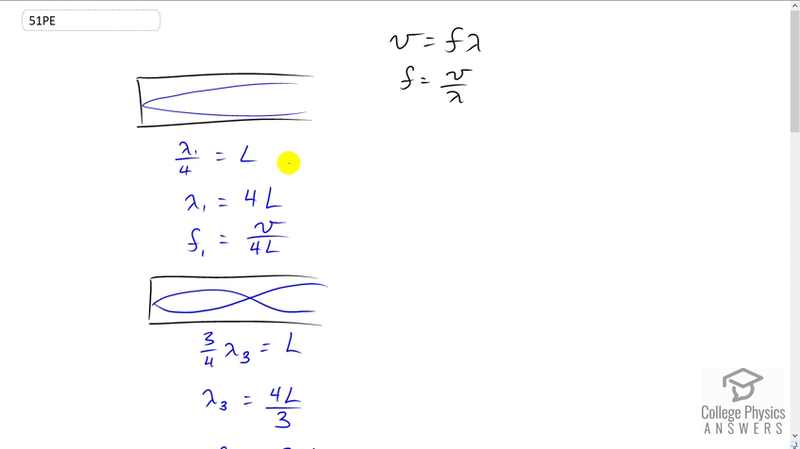 So lambda one over four is equal to L. And in that case, the fundamental wavelength is four times L. And so the fundamental frequency is wave speed divided by four L because wave speed is frequency times lambda. And we can solve for f by dividing both sides by lambda. And then the first overtone which is the third harmonic, second harmonic does not exist because it is a closed end tube. And we have to have a pressure antinode here and the pressure node here. And the only way for that to happen is if you have a three quarters of a wavelength in the tube or one quarter of a wavelength or three quarters and so on. And five quarters and so on. So in this picture here we have the next existing harmonic, the third harmonic which is the first overtone, three quarters lambda three equals L and we will solve it for lambda three and that is four L lambda three. And that is four L over three. And then we get an expression for the third harmonic frequency. It is going to be three v over four L because we are going to be going v divided by this which is the same as multiplying by its reciprocal so multiplying v by three over four L. Now, the third harmonic as a function of temperature is going to be three times-well, we are figuring out what this speed of sound is in air at 37 degrees Celsius, so we need to have an expression for this in terms of temperature. So we have three times 331 meters per second times square root of absolute temperature divided by 273. And then divide alike by four L. So that's three times 331 meters per second. This being the first overtone times square root of 37 degrees Celsius converted into Kelvin by adding 273.15 and divided by 273 and divided by 2.4 centimeters which is 2.4 times ten to minus two meters. And this works out to 11.0 kiloHertz. That is the first overtone, the third harmonic. Now if you look at figure 17.38 here, 11 kiloHertz is about here so, and you can see that this point on the perceived loudness curve is quite high. Meaning, you have to have quite a high sound level in order to perceive a given loudness for this frequency. And so the ear is not sensitive to this frequency given a frequency of 4000 Hertz for example. You would perceive the sound loudness at a much smaller sound level. And so at 4000 Hertz, yes the ear is sensitive but 11 kiloHertz , the ear is not sensitive. And so I suppose that the resonance in the ear canal is either not significant or things are more complicated than accounted for by this model of the ear canal as a simple tube closed at one end.